March 29th, 2017, Los Angeles, CA – The Getty Research Institute announced today the acquisition of a major archive of the world-renowned architect Frank Gehry. The Frank Gehry Papers cover more than thirty years of his singular career and includes comprehensive material on some of his best-known projects. The acquisition is part purchase and part gift. “Frank Gehry is undoubtedly the world’s most famous living architect. This extensive archive, covering the first three decades of his illustrious career, offers an in-depth look at the genesis of Gehry’s distinctive style and includes many of the projects for which he is internationally known,” said Thomas W. Gaehtgens, director of the Getty Research Institute. The archive encompasses the period from Gehry’s early graduate studies to the 1988 competition entry for the Walt Disney Concert Hall, the success of which marked Gehry’s entrée into a global architectural elite. (Gehry won the prestigious Pritzker Architecture Prize the following year, in 1989.) 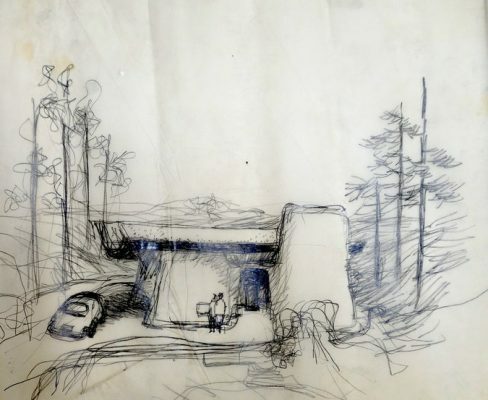 The archive includes drawings, partial and complete models, project documentation, correspondence, photographs and slides, and ephemera pertaining to 283 projects designed between 1954 (the Romm House project) and 1988 (the Walt Disney Concert Hall competition). The collection also includes materials produced after 1988 for projects which were initiated before that date, including construction documents and models for the Disney Concert Hall (completed in 2003), early design drawings for the Grand Avenue Project (still in development), and materials relating to later phases of projects which had begun much earlier (Loyola Law School, 1520 Cloverfield, and the Gehry Residence in Santa Monica, to mention a few). In total, these documents offer a comprehensive portrait of the emergence and rise to prominence of Gehry’s architectural practice over a 30-year period. 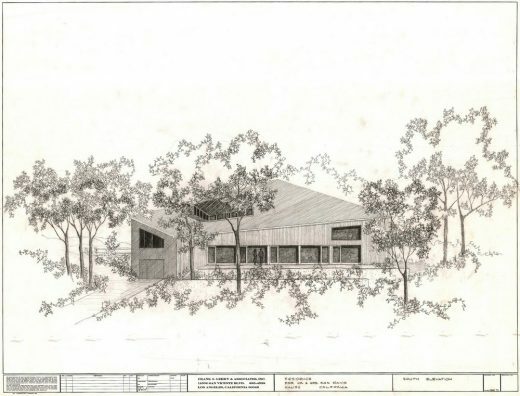 The Gehry Archive is massive, comprising approximately 1,000 sketches, more than 120,000 working drawings, more than 100,000 slides, hundreds of boxes of office records, personal papers, and correspondence, 168 working models, and 112 presentation models. In addition to these physical materials, the collection includes digital files which represent Frank Gehry’s pioneering work in developing software platforms crucial in the design process. These digital files pertain to designs for the Vitra Museum (1989), the Disney Concert Hall, and the Grand Avenue Project. Selections from this archive, including drawings, a model, and photographs of the Walt Disney Concert Hall (2003), will be on view in the upcoming Getty Research Institute exhibition Berlin/Los Angeles: A Space for Music on view April 25 through July 30, 2017 This exhibition celebrates the 50th anniversary of the sister-city partnership between Berlin and Los Angeles by exploring the Berlin Philharmonic (1963), designed by Hans Scharoun, and the Walt Disney Concert Hall. Both buildings have captured the public’s imagination, becoming signature features of the urban landscape of their respective cities. Focusing on the buildings’ extraordinary interiors, this exhibition brings together original drawings, sketches, prints, photographs, and models to convey each architect’s design process. Berlin / Los Angeles demonstrates how the Berlin Philharmonic and the Walt Disney Concert Hall were pivotal in fostering a strong resonance between architecture and the city. Born in 1929 and raised in Toronto, Frank O. Gehry moved with his family to Los Angeles in 1947. Gehry received his Bachelor of Architecture degree from the University of Southern California in 1954, after which he continued his studies in City Planning at the Harvard University Graduate School of Design. 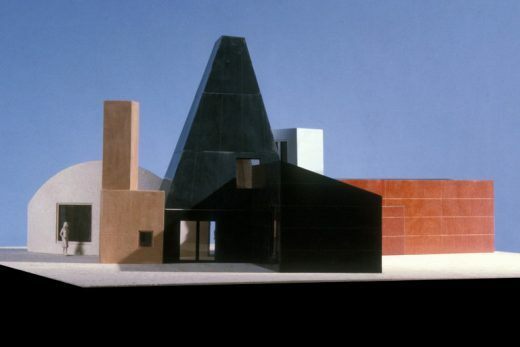 In 1962, Frank Gehry returned to Los Angeles and founded his firm in collaboration with Greg Walsh. The office quickly became known for its innovative use of physical models and drawings in the design process; it later became a leader in the development of new platforms for computer modeling of architectural projects. Over six decades of practice, Gehry’s firm has built an architectural corpus of important public and private buildings in America, Europe, and Asia. Among the office’s most notable works are: the Danziger Studio in Los Angeles (CA); the Gehry Residence in Santa Monica (CA); the Frederick Weisman Museum of Art in Minneapolis, Minnesota; the Guggenheim Museum in Bilbao, Spain; the Walt Disney Concert Hall in Los Angeles (CA); the Fondation Louis Vuitton in Paris, France; and the West Campus for Facebook in Menlo Park (CA). His work has earned him many prestigious awards in the architectural field. In 1989, he was awarded the Pritzker Architecture Prize, perhaps the premiere accolade in the field. In 2008, he received the Golden Lion Lifetime Achievement Award at the Venice Biennale. The third annual Getty Medal was awarded to Gehry in 2015. Frank Gehry was the recipient of the Medal of Freedom awarded by President Barack Obama in 2016. The Getty Research Institute is an operating program of the J. Paul Getty Trust. It serves education in the broadest sense by increasing knowledge and understanding about art and its history through advanced research. The Research Institute provides intellectual leadership through its research, exhibition, and publication programs and provides service to a wide range of scholars worldwide through residencies, fellowships, online resources, and a Research Library. The Research Library—housed in the 201,000-square-foot Research Institute building designed by Richard Meier—is one of the largest art and architecture libraries in the world. The general library collections (secondary sources) include more than 1,000,000 volumes of books, periodicals, and auction catalogues encompassing the history of Western art and related fields in the humanities. The Research Library’s special collections include rare books, artists’ journals, sketchbooks, architectural drawings and models, photographs, and archival materials. His work has earned Frank Gehry several of the most significant awards in the architectural field. He was inducted into the College of Fellows of the American Institute of Architects in 1974, and his buildings have received over 100 national and regional A.I.A. awards. In 1977, Mr. Gehry was named recipient of the Arnold W. Brunner Memorial Prize in Architecture from the American Academy of Arts and Letters. In 1989, he was awarded the Pritzker Architecture Prize, perhaps the premiere accolade of the field, honoring “significant contributions to humanity and the built environment through the art of architecture.” In 1992, he received the Wolf Prize in Art (Architecture) from the Wolf Foundation. In the same year, he was named the recipient of the Praemium Imperiale Award by the Japan Art Association to “honor outstanding contributions to the development, popularization, and progress of the arts.” In 1994, he became the first recipient of the Dorothy and Lillian Gish Award for lifetime contribution to the arts. In 1998, Mr. Gehry received the National Medal of Arts, and he became the first recipient of the Friedrich Kiesler Prize. In 1999, Mr. Gehry received the Lotos Medal of Merit from the Lotos Club, and he received the Gold Medal from the American Institute of Architects. In 2000, Mr. Gehry received the Gold Medal from the Royal Institute of British Architects, and he received the Lifetime Achievement Award from Americans for the Arts. In 2002, Mr. Gehry received the Gold Medal for Architecture from the American Academy of Arts and Letters. Mr. Gehry was named a Fellow of the American Academy of Arts and Letters in 1987, a trustee of the American Academy in Rome in 1989, and a Fellow of the American Academy of Arts and Sciences in 1991. In 1994, he was bestowed with the title of Academician by the National Academy of Design. In 1998, he was named an Honorary Academician by the Royal Academy of Arts. In 2003, Mr. Gehry was inducted into the European Academy of Sciences and Arts and he was designated as a Companion to the Order of Canada. In 2005 Mr. Gehry received the Ordre National de Legion d’honneur Chevalier from the French Government. In 2006 he was a first year inductee into the California Hall of Fame. In 2008, Mr. Gehry received the Golden Lion Lifetime Achievement Award at the Venice Biennale. In 2010, Mr. Gehry received the John Singleton Copley Award from the American Associates of the Royal Academy Trust, and he received the Cooper Union for the Advancement of Science and Art Award in New York. Mr. Gehry has received honorary doctoral degrees from Occidental College, Whittier College, the California College of Arts and Crafts, the Technical University of Nova Scotia, the Rhode Island School of Design, the California Institute of Arts, the Southern California Institute of Architecture, the Otis Art Institute at the Parsons School of Design, the University of Toronto, the University of Southern California, Yale University, Harvard University, and the University of Edinburgh. Mr. Gehry has held teaching positions at some of the world’s most prestigious institutions including Harvard University, University of Southern California, University of California Los Angeles, Sci-Arc, University of Toronto, Columbia University, the Federal Institute of Technology in Zurich, and at Yale University where he still teaches today. Notable projects include: the Guggenheim Museum in Bilbao, Spain; the DZ Bank Building in Berlin; Nationale-Nederlanden Building in Prague; the Jay Pritzker Pavilion and BP Bridge in Millennium Park in Chicago, Illinois; Maggie’s Centre, a cancer patient center in Dundee, Scotland; Hotel Marques de Riscal in El Ciego, Spain; Lou Ruvo Brain Institute in Las Vegas, Nevada; Princeton University Peter B. Lewis Science Library in Princeton, New Jersey; Art Gallery of Ontario Renovation in Toronto, Ontario, Canada; the New World Symphony in Miami, Florida; the Eight Spruce Street Residential Tower located in New York City; and the Walt Disney Concert Hall in Los Angeles, California. Projects under construction include the Signature Theatre in New York City; the Ohr O’Keefe Museums in Biloxi, Mississippi; the Make it Right Foundation in New Orleans, Louisiana, the Puente de Vida Museum of Biodiversity in Panama; the Frederick R. Weisman Art Museum Expansion at the University of Minnesota; and the Foundation Louis Vuitton Museum in Paris, France. Mr. Gehry is also completing work on the Guggenheim Abu Dhabi; LUMA Foundation in Arles, France and the University of Technology, Sydney in Sydney, Australia. March 30, 2017 in Architects.